That's awesome!!! How many of them do you think were Siege Rhinos/Storm Crows? October 12, 2018 2:15 p.m.
October 12, 2018 2:31 p.m. Edited. Hmmmmm. I may have to start looking out for myself around here. It appears some of us around here should maybe not receive our full vote of confidence. October 12, 2018 5:23 p.m.
Icbrgr exactly naught were Siege Cow, as I hate that card, and it has been well established that Eager Construct is better than Storm Crow. Scrying beats Flying. October 12, 2018 9:57 p.m.
clayperce will be here all night. October 12, 2018 10:04 p.m. Edited. 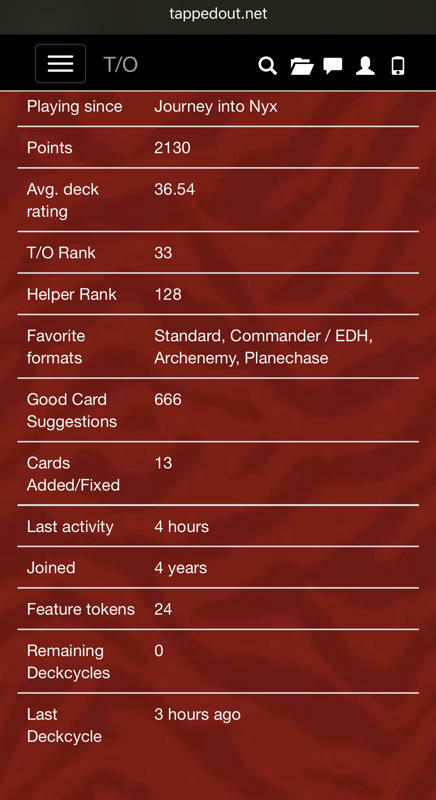 October 13, 2018 2:30 p.m.
xhuggels yours was the last deck I commented on and you accepted my suggestions so yes, you gave me the 666. October 13, 2018 10:38 p.m.
October 14, 2018 3:25 a.m.
November 11, 2018 6:37 p.m.